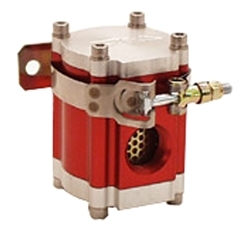 This billet aluminum fuel filter flows 90 gallons a minute with no pressure loss. It is compatible with gasoline, alcohol,and nitro methane. remote mount bracket included. WARNING: This product contains a chemical known to the State of California to cause cancer and birth defects or other reproductive harm."